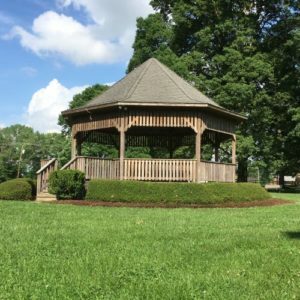 In response to a community-wide survey which indicated strong public support for recreational facilities, the Village of Tobaccoville purchased 14 acres of farmland adjacent to Village Hall in 1993. The first phase of park development began in 1994 and included site grading and seeding of the land. Next, two acres of the parcel were set aside for the future construction of a community center. A 1/3 mile walking trail, a softball field, a large, open recreational field, and a gravel parking lot were completed in 1994. These projects were funded entirely by Village funds. The naming of the park was based on a community-wide citizen survey and “The Village Park” was chosen by a unanimous vote of the Village Council. Additional projects completed in the park include tennis and basketball courts, several arbors with swings, 2 horseshoe pits, an upper gravel parking lot, a gazebo, a vending building, and extensive plantings of trees and shrubs each year as dictated by a master planting plan. The 5,000 sq. ft. Alice Watts Tuttle Community Center was dedicated in September of 2001, and a Veterans Memorial was dedicated on November 11, 2002. On May of 2008, a Tobacco Farming Museum was officially opened in the historic tobacco barn located in the park. The barn was originally built in 1885 and was donated to the Village by Mr. W. G. (Jack) Doub in 1992. This museum showcases the history of tobacco farming and is open for tours on a seasonable basis. In July of 2008, the Village completed the addition of a wireless internet connection for public use by park patrons. In the fall of 2017, a Little Free Library was constructed and installed in the park as a Girl Scout Gold Award project by Miss Elise Colburn. In December of 2017, the Village completed the purchase of 9.5 acres of farmland adjacent to the western boundary of Village Park for future recreational needs and green space. The Village has applied for a PARTF grant, which if received, would reimburse 50% of the purchase price of the property. As part of the grant application, a survey regarding the future use of this land was performed. The results indicated strong resident support for new recreational opportunities. Development of this property will take place over time through proper planning and as funding becomes available.